It's finally starting to feel like fall in NYC! I know it sounds cliche, but it's true. On Wednesday, I finally wore a light jacket over my dress to work and felt like it was actually needed. It's strange how sometimes the seasons just blend together. Also TGIF! I am so excited for this weekend. I'm heading to an event with The Feed Feed and Vitamix, and then hopefully will get in a few hours at the pottery studio afterwards. Last weekend at the studio I finally used the slab roller and made a pour over cup for coffee and two big, chunky coffee mugs. I'm looking forward to firing and glazing them! I got my first two pinch pots back the other week and they are so cute despite the flaws. My pottery class has been really hard but so relaxing. I've started looking forward to each Wednesday night as it's become a fun creative escape for me. Sometimes we just need to flex our brain muscles in a different way, right? To make the crust, preheat the oven to 350 degrees F and line a 9x9 square baking dish with parchment paper. Melt the butter in a saucepan over medium heat, stirring occasionally. The foam will eventually go away and the butter will brown and become nutty. Remove the butter and let it cool to room temperature. In a large bowl, combine flours, sugar and salt. Add in the cooled butter and stir with a wooden spoon until a ball forms. Using fingertips press the dough evenly into the prepared baking dish and bake until golden brown (about 20 minutes). Once ready, take it out of the oven and let cool. Make the filling by combining the black plums with the vanilla, sugar, lemon zest, and spices. Stir so that fruit is coated evenly. Pour mixture on top of cooled crust and spread evenly. 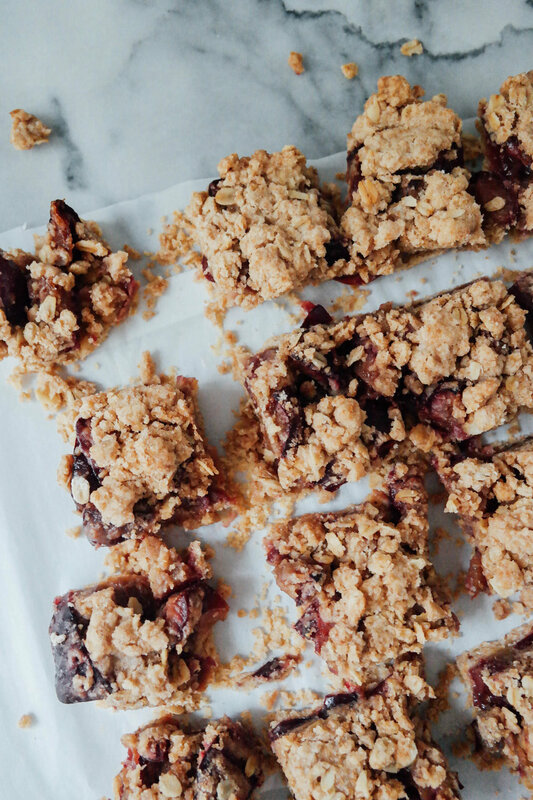 Make the crumble crust by combining flour, oats, sugar and salt in a medium bowl. Stir to combine and add in softened butter so that it is evenly mixed. Add the crumble on top of the fruit mixture. Press everything down and bake for about 50 minutes until plums are bubbling and juicy. Remove and let cool. Slice to serve.